A bit of relief from the heat this weekend as temperatures should drop to near normal for this time of year. Very warm again next week though! 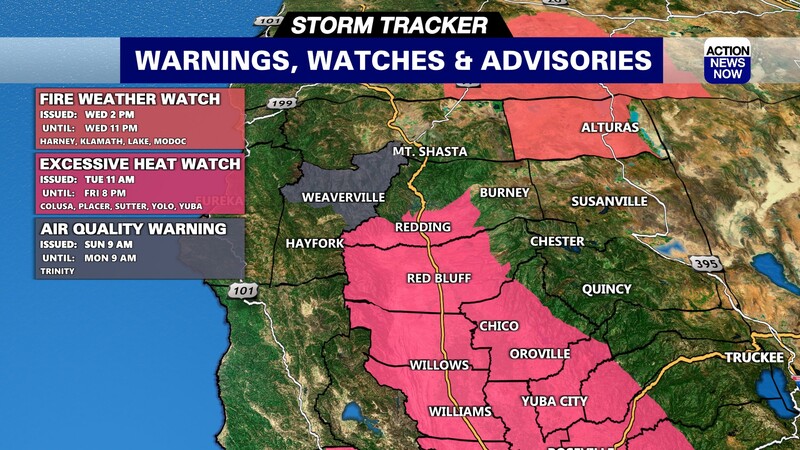 Critical fire danger is prompting a Red Flag Warning to continue across Northern California today. The biggest concerns for fire danger will be very low humidity, gusty North winds, and hotter temperatures ahead for today. Humidity has not recovered well overnight, and is mostly below 35 percent in the valley for the start of the day. Humidity is expected to dip into the 5 to 15 percent range this afternoon, which could result in new fires being started very easily. Temperatures have stayed slightly warmer overnight, with valley areas dipping into the high 50's to mid 60's, and mountain areas dropping into the 30's to 40's overnight. Winds are already strong for the start of your Thursday. Winds are expected to pick up out of the North to around 20mph this afternoon, with gusts up to around 30mph. Stronger winds could result in the enhanced spread of fires in our region. 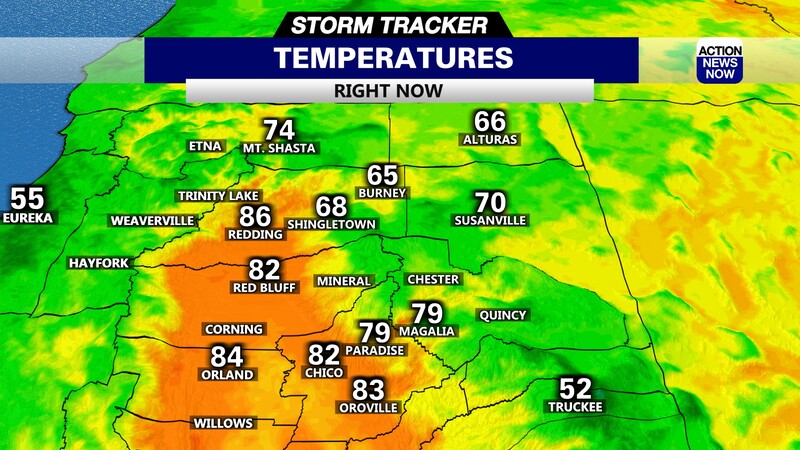 Temperatures are projected to top out in the mid 90's for the majority of the valley today and in the 70's to mid 80's in the mountains this afternoon. 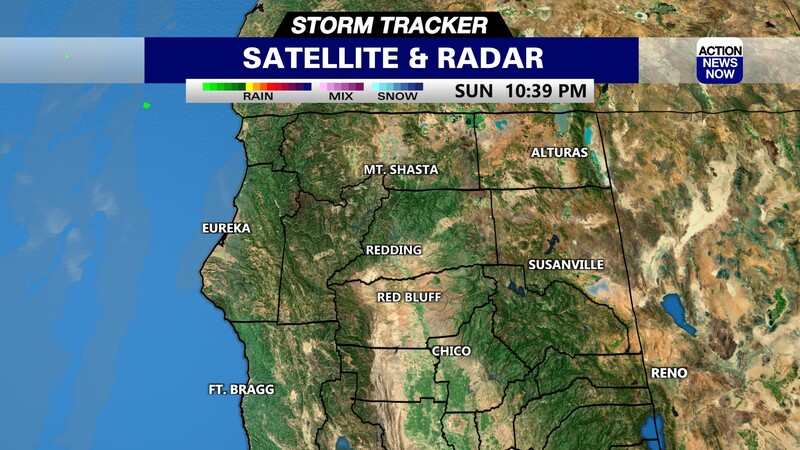 The Red Flag Warning is set to stay in place for the valley and foothills through 7pm tonight. Slightly cooler temperatures, lighter winds, and higher humidity will help fire danger dip back into the moderate to high range on Friday. Temperatures are expected to be around 2 to 3 degrees cooler than Thursday afternoon. Valley areas will end up in the high 80's to low 90's from Friday then drop into the mid to upper 80's for the weekend. This weekend even has a few mountain showers in the forecast, it won't be much but we'll also have some clouds in the valley and slightly cooler temperatures. By Sunday the winds will pick up again and it will be warm and dry as we head into next week. Cooler weather with showers this week!